UK Pound v The Euro #GBPEUR #DOW #Gold We’re keeping a fairly close eye on this pairing for obvious reasons. And it’s making little sense! (no surprise). The recent break above the ruling downtrend should have reached 1.164 but unfortunately, the rise fizzled at 1.158 and this was not a good sign. It implies weakness. Visually, it’s fairly obvious a glass ceiling in this relationship exists at 1.158 – meaning we dare not take any rise too seriously until such time the pairing manages to actually close a session above this level. Unfortunately, a movement such as this is liable to trigger some travel to an initial 1.175 with secondary, if exceeded, at 1.20. Of course, there’s another problem visible at 1.20 as the pair appear to have history at such a level, the implication being of yet another glass ceiling in waiting. Once again, the relationship will require to actually close a day above 1.20 before anyone dare believe some quite strong future movement is coming, in this case we’re calculating 1.32 and the potential of a future challenge against the downtrend since 2015. 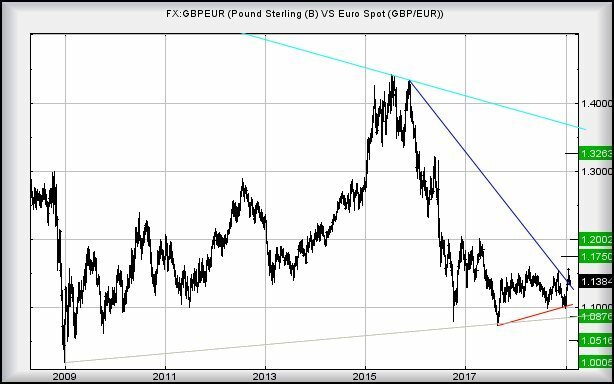 Hopefully, the foregoing makes it clear the concept of rushing out and taking a position, based on future strength of the pound, is a concept fraught with danger. After all, the pairing need only weaken below 1.103 at present (RED) to justify a degree of very real panic. Something quite strange has been happening with this argument. The Big Picture demands the pairing relax to 1.05 and so, quite amazingly, do movements since the Brexit vote. Just ‘cos the price has not reached such a level yet doesn’t mean it shall not. It’s probably just a timeframe thing, something which appears to be infecting the wider marketplace while everyone awaits something actually happening. Of course, the big question is what if 1.05 breaks?